Grandfather sets the bowl full of marbles before me. in a tremulous trip toward the saucer. more adroit than a fork. Never point your chopsticks at a guest. Never spear your food like a fisherman. Don’t tap the side of your bowl like a beggar. in an urn for the dead. then lands with a clink! Previously published in The New Quarterly (Fall 2017), winner of the Nick Blatchford Occasional Verse Contest 2017, and forthcoming in Odes & Laments (Caitlin Press, Fall 2019). 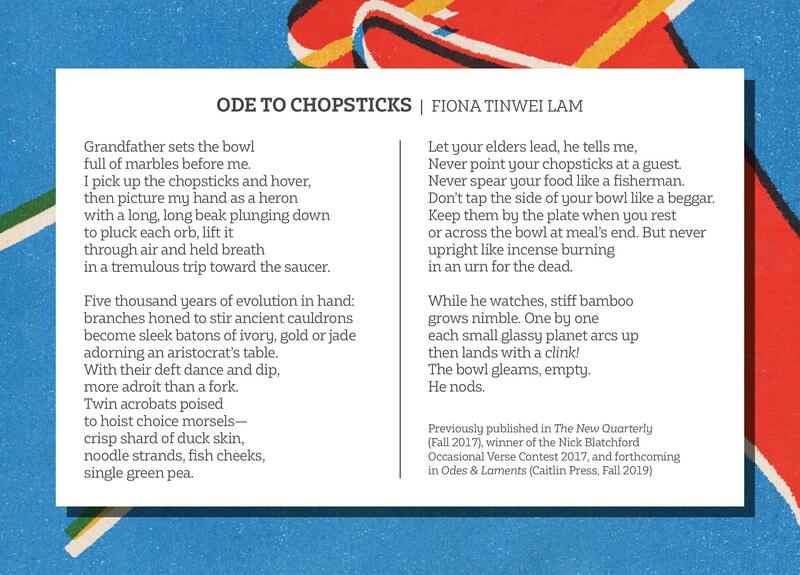 Fiona Tinwei Lam has authored two poetry books and a children’s book. She edited The Bright Well: Canadian Poems on Facing Cancer, and co-edited Love Me True: Writers on the Ins, Outs, Ups & Downs of Marriage. She has won The New Quarterly‘s Nick Blatchford prize and was a finalist for the City of Vancouver Book Award. Her work appears in over thirty anthologies, including The Best of the Best Canadian Poetry: 10th Anniversary Edition and Forcefield: 77 Women Poets of BC. Her poetry videos have screened at festivals locally and internationally. Her new collection of poems is forthcoming with Caitlin Press in 2019.